His voice wobbled, overcome as he was with emotion – a bittersweet mix of joy and distress. The events of Saturday night in Sochi will live long in Edinson Cavani’s memory. The sharpshooter’s double against Portugal took Uruguay through to the 2018 FIFA World Cup Russia™ quarter-finals. “I’m happy about what happened. It’s exciting; there are no words to describe this,” said Cavani after the match. It was all a bit much for the forward, who was visibly fighting back the tears while, in the background, the chants of the indefatigable La Celeste fans reverberated around the Fisht Stadium. Cavani broke the deadlock in the opening ten minutes, powering a header past Rui Patricio after timing his run perfectly to meet a fizzed pass from his attacking partner in crime, Luis Suarez. Then, in the second half, when Portugal had the wind in their sails after equalising, the Paris Saint-Germain star tipped the scales back in Uruguay’s favour with an exquisite curler. Once more, he had found space expertly and delivered in deadly fashion. 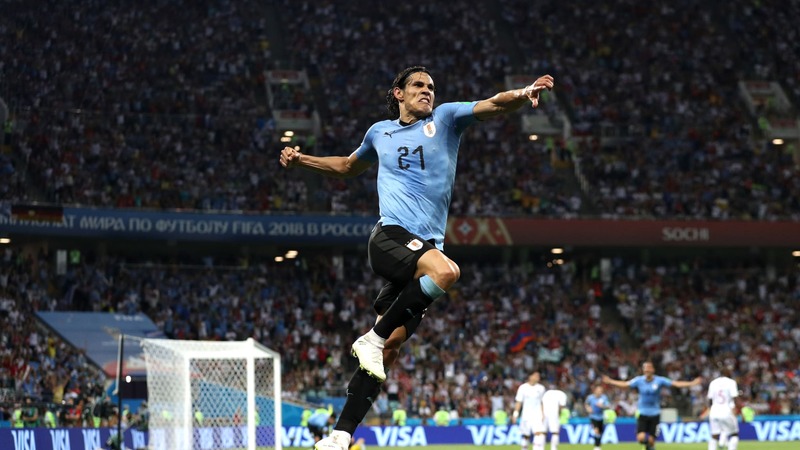 “He’s the man with a thousand lungs,” Lucas Torreira told FIFA amid Los Charrúas‘ celebrations, hailing Cavani’s all-round contribution beyond his finishing. “He pops up all over the pitch and helps us all a lot. The effort he puts in is incredible,” added the midfielder. The pinprick that threatened to burst the Uruguayan bubble came in the 74th minute. With a quarter of an hour left, Uruguay’s hero of the night limped off the pitch – nobly aided by Cristiano Ronaldo – with pain written all over his face. Hence his tears of joy at the final whistle were also tinged with anguish. A battle surely awaits Uruguay on Friday, when they take on much-fancied France in the quarter-finals in Nizhny Novgorod. This occasion will be extra special for El Matador if he is able to take part, as Les Bleus’ squad include several of his PSG club-mates. Foremost among these weapons is Cavani, who the Uruguay squad and fans alike are hopeful will put his injury scare and tears of worry behind him in order to dispatch Didier Deschamps’ side like he did the European champions.